Sometimes you don’t need to go far to escape the frenzy of the city. Forget about charming mountain retreats or luxury seaside homes, this humble beauty provides the perfect place to escape it all right in a Boerum Hill, Brooklyn backyard. 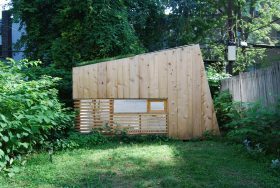 Crafted by local studio Hunt Architecture using salvaged cedar and fence pickets, the Brooklyn Garden Studio is a grown-up version of the classic treehouse.